I’m in the midst of packing three kids off to summer camp as I am sure many other parents are as well. Every year the sheer amount of clothes, linens and supplies irks me. The packing list advises that each child should have 15 pairs of underwear, 15 socks, 15 short-sleeved shirts; enough for a three week session during which laundry is done only once. This is the second time all three of our kids are going off to camp and thus, you would think, we’d have enough of all that from last year. But no, kids grow! The only one who has almost enough is the youngest as he does inherit some clothes from his brother. But not socks, for instance; those don’t survive. So off we go to Target. We get 3 tubes of aloe (most other kids don’t bring this and my boys rule become master suppliers because they’re the only ones with cooling agent for sunburns, which all the kids get, no matter how much sunscreen you pack…), 3 bottles of shampoo, lotion, liquid soap, bug spray, anti-itch spray, etc. What the kids bring back will last the whole family into the next summer. I still have some personal items left from last year, neatly labeled, and we are reusing those! My daughter buys 7 sports bras (she’s going horseback riding) and I cringe at the cost: $16.99/each. The rest of the year she needs two. Because we do laundry. 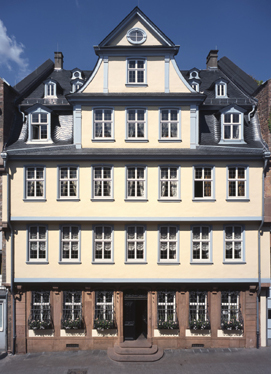 And that reminds me of the Goethe Haus, Goethe’s parental home in Frankfurt where he was born in 1749. I visited this stately house in downtown Frankfurt as a kid with my grandmother who lived in nearby Wiesbaden. I remember how astounded I was at the big closets they had (armoires actually). My grandmother explained that this was necessary because they needed to have enough linen for several months. Laundry was only done three times a year. It was, after all, a big and cumbersome job. The maids would have to schlep all the dirty laundry down to the river, swish bed sheets in the flowing water, scrub everything on washboards, rinse it again, spread it out on the meadows to dry in the sun. Not to mention the hauling back, the ironing and the folding. It was a huge production. Our linen closet isn’t stuffed with linens for four months, but it is stuffed with old scruffy sheets, mismatched pillow cases, and fraying towels. I should have thrown those out years ago but last year, as I was packing three kids off to camp, I was happy I’d never gotten around to purging it. We wouldn’t have had two pillow cases, two sets of sheets (equals four), three bath towels, and two beach towels per child. We are not living in the 18th century like Goethe’s family. We do laundry several times a week. Love this post about connecting the past to the present. Great post, but those sports bras are really too expensive….LOL. hah! Great posts- as for the 15 undies…don't the camp people know kids wear one pair for 5 days ;)…as for the Goethe's house- oh my- that is sooo interesting, I never knew they did laundry only once every 4 months!! I'm always grateful for my mismatched sheets- I always seem to be housing someone or another and have to grab an 'extra' sheet to throw on the spare mattress. The Desert Rocks – indeed! Anjuli – last time my younger son came home from camp with half of his suitcase full of clean, untouched clothes… The whole thing reeked so badly, however, that I did have to wash everything.